Secular Pro-Life Perspectives: Facebook likes campaign a success! "Shoot for the moon, and if you miss, you'll land among the stars." That was our philosophy when we set our aggressive goal for last week's likes campaign. And what stars Secular Pro-Life has reached! You caused a thirty percent increase in likes, and as of this writing, the SPL facebook page now has over 3,200 fans! 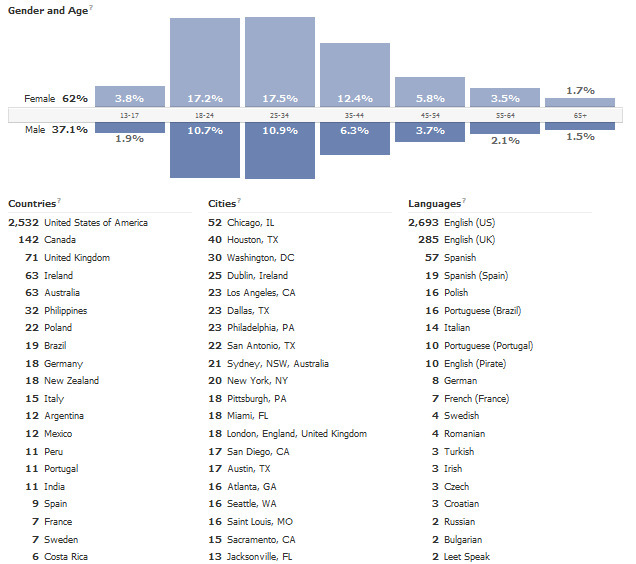 SPL fans are incredibly diverse in terms of age, gender, geography, and of course (although Facebook sadly doesn't track it), religion. We are so thrilled to be building a unique community to advocate for the unborn based on science, reason, and human rights. Whether you just learned about SPL last week or have been a Secular Pro-Lifer for years, thank you for your support! We have big plans for the next few months, so stay tuned. In the meantime, even though our official likes campaign has come to an end, you can always introduce your friends to Secular Pro-Life! Far too many secular pro-lifers believe that they are the only one out there. Let's give them some hope that they are not alone.